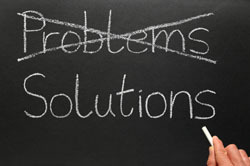 When faced with a problem we use the tools at our disposal to solve it. If the problem is urgent, we use our favorite tool. If we have more time, we might look at the tools in our tool belt and decide which tool is best. When a new problem faces us most of the time we want to use one of the following tools: programs, finances or volunteer resources. When faced with a really big problem, we use all three. An elegant solution is defined as, “A solution that uses the least amount of resources but also solves the problem in the best way.” This term was coined a few years ago within Toyota. So here’s a real life scenario. Tell me how you’d solve this with an elegant solution. A high end fitness club wanted to give it’s members a perk and started putting very expensive shampoo in the showers. They placed the entire bottles on each shelf in each stall and they got a tremendous response. People loved this shampoo. The problem was this: full bottles were also disappearing from the showers. The lawyers, doctors and otherwise exemplary citizens weren’t a bad element, they would just throw the bottle in their bag after they used it. The gym decided to try to solve this problem with an elegant solution. They wanted to eliminate the stealing completely, yet they didn’t want to use any additional resources to solve the problem. QUESTION: How would you solve this problem? I’ll continue next week with a follow-up where we’ll draw some parallels between this and youth ministry.